If you’re looking for the best all-inclusive hotels in Tenerife, then look no further than GF Isabel. The facilities and entertainment in this family focused all-inclusive hotel are specifically designed with kids in mind. While the children have fun under the supervision of the hotel’s staff members, the parents can go swimming in one of the heated pools or pamper themselves at the on-site beauty salon. The climate is warm throughout the year, which gives guests an opportunity to spend most of their time by the pool or at the sandy beach – water sport lovers will be in their element with plenty of attractions worth soaking up at popular Playa Del Duque beach. GF Isabel is situated in the southern part of Tenerife, in a privileged region with a number of sight-seeing opportunities. 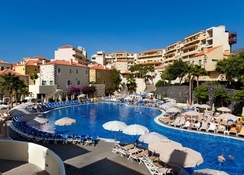 This all-inclusive Tenerife hotel is just 900m from the Fanabe beach, where you can make a splash in clear blue water. The islands capital Santa Cruz de Tenerife is about a one-hour drive, where you can also find La Laguna, which is a world heritage site. The Loro Parque is about 65km away, a must-visit place that houses a large number of animal and plant species. The Tenerife South Airport is only 18km from the hotel. There are many bars, disco pubs and water parks near the hotel, too. GF Isabel is among the best all-inclusive hotels in Tenerife thanks to its spacious and impressive rooms. The accommodation in this family-friendly hotel offers Apartments, Accessible Apartments, Bungalows, One-Bedroom Villas and Two-Bedroom Villas. Guests can opt for apartments, bungalows or villas to enjoy the best sea views. All rooms have a beautiful kitchen with the essential kitchenware. Cribs for babies are provided upon request. Guests with mobility issues can reserve one of the accessible apartments. The hotel offers all the necessary amenities in the rooms, including a smart TV, air conditioner, hair dryer, telephone, safe, bathrobes and toiletries. 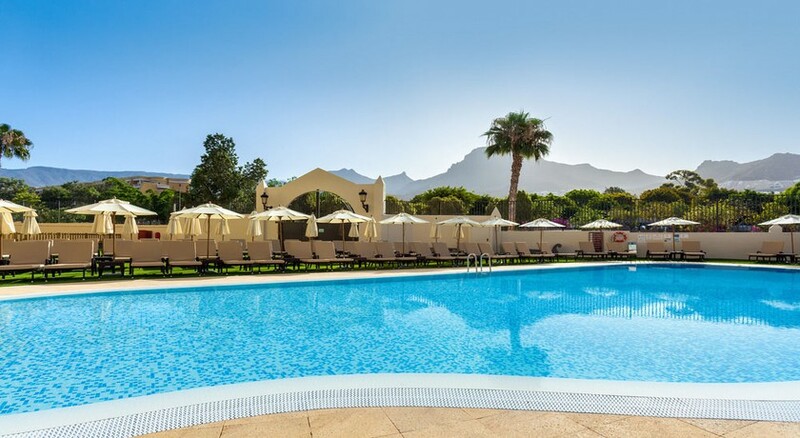 The hotel includes one restaurant and five bars, namely the Plaza Canaria Buffet Restaurant, where guests can satisfy their appetite with Spanish and International cuisines. The restaurant has a rustic décor with lamps and wooden balconies. Guests also have the choice to enjoy their breakfast on the open terrace. The pool bar makes it convenient to have drinks and food al fresco, plus it offers a selection of meats, desserts, salads, breads, cheeses and much more. The Lounge Bar and Tasca Bar are also available on-site where you can enjoy a coffee or a refreshing drink. GF Isabel provides a host of sports facilities and entertainment for guests of all ages, especially kids. While you are taking a relaxing swim in one of the heated pools or pampering yourself at the salon, the younger ones can have fun in the children’s pool or the mini club, where loads of entertainment is available. If you’re feeling energetic, hit the basketball or the football area, or test your golfing skills in the mini golf spaces available in the hotel. Very pleasantly surprised at the quality of the accommodation, the resort itself, the food- had champagne on the last morning! and the staff. We stayed at this hotel for a week in March, all inclusive. We arrived at midnight and were greeted pleasantly and taken to the restaurant where there was food and drink for us, which we were grateful for. The hotel was lovely, and the swimming pool and surrounding areas were also really good - our bedroom was huge, with kitchen and seating area, also a very large balcony. There was plenty of choice for food and drink throughout the day. The hotel is near shops, bars, beach etc. Recommended.